"A troubled Norn writes in... There's no cheese left in Albia!" 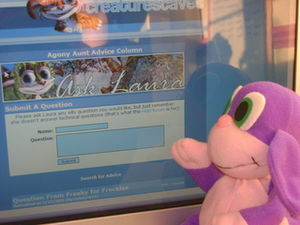 Ask Laura is an agony aunt advice column at Creatures Caves, based on the original Ask Trish column at Helen's Bibble Directory. It originates from an email which Laura sent to Helen, asking if she could contribute to Ask Trish in any way. The idea was then forwarded to Rascii who implemented it. The column is light hearted humour, offering advice on coping with the daily woes of Albia's/the Shee Ark's inhabitants. Whether the creatures (and let's not forget the Hand!) who write in are unhappy in love, experiencing difficulties with inter-species relationships, having caretaking problems, or even if they've just run out of cheese and don't know how to cope, Ask Laura is there to help. My Norn wants to dye his hair pink with a pigment rotation in his head... I think fluorescent green would suit him better. Since I have the power to do whatever I want, do I make him happy, make me happy, or feed him to the piranhas? What do you think? Is your Norn a adolescent by any chance? Teenagers love expressing themselves. I reckon fluorescent pink would be really wicked since green is so last year! If you do decide to disagree with him prepare to expect rebellion. Imagine how impressed the other Norns will be when they see him with pink hair! It might impress the females if you know what I'm saying. Let him have the pink hair! He'll soon get tired of it anyway. A Grendel-Hide Couch. Pushing the couch scares the Grendels a little and comforts the Norns. It also regularly vends mouldy carrots, the occasional lost sock and one other rare, 'surprise' item from inbetween the 'cushions'. Edible Crayon Seeds. Dispensed from a crayon box-seed packet, these seeds grow into edible crayons of purple, green, orange and yellow; a waxy addition to any homely garden! They decrease hunger to a minimum when eaten. Tea Shee Tea Set. A tea set with four mismatched teacups, a teapot and a table. The teapot can be filled with various ingredients - food, fruit, seeds - to make different concoctions of tea. The teapot lid opens when offered an ingredient it can accept. When each ingredient is put in, it can be seen through a window in the pot, before it fades away and turns into tea. The colour of the tea indicates what ingredients were used. For example, food: blue, seeds: green and fruit: red. Holding the teapot, and putting the spout close enough to a cup, tips the teapot, which begins filling a cup with tea. A cup steams when it is full. Drinking the tea decreases thirst and increases happiness. A full cup is classed as 'food', while an empty cup is classed as a 'gadget' that Ettins can steal. Cheese Appreciation Day Dispenser. In honour of the Grendels' bi-annual 'Cheese Appreciation Day', this dispenser vends different varieties of cheese. Notably, each piece of cheese has a green tinge, and when a Grendel eats it their hunger/happiness is significantly decreased/increased, compared to when a Norn or an Ettin eats it - meaning that this dispenser is primarily Grendel-friendly. Provisionally, the cheese dispenser will look like a statue of a Grendel holding out its claws. When pushed, a random variety of cheese will fall from its mouth and into its claws, where creatures can then pick it up. The more cheese that's ordered, the more extra pieces will drop. The Atomiser Cannon. A simple toy ray gun for your Norns to play with. Its neon beam 'obliviates' duplicate objects, checking beforehand to make sure that there's more than one of an object present, and that it doesn't fall within certain categories (ie. creatures, toys). The beam also ricochets off the walls and ceiling for an added fun effect. A Norn's happiness is increased when the Atomiser Cannon is activated, as though watching the beam bounce off everything amuses them. A Princess Norn (wearing a standard white princess hat and a purple dress): "O, save me Prince Charming!" A Prince Charming Norn (wearing a gold crown and a blue cape): "I shall save you, my fair maiden!" Little Red Riding Norn (wearing a red hood): "Oh, grandma, what great teeth you have!" The Big Bad Grendel (wearing a pink nightcap and a pink nightdress): "All the better to eat you with, my dear!" A Norn (wearing a silver helmet): "I am Beowulf!" The column first opened its doors to curious Norns on June 3rd, 2003. The 500th Ask Laura question was submitted on the August 3rd, 2005. The Ask Laura Mystery Agent was created by Liam and nornagon to commemorate this. This page was last modified on 31 May 2016, at 20:36.